Jeanneau’s line of Sun Odyssey family cruising boats has been at the core of its identity as a mass-production boatbuilder for several decades now. In introducing this latest iteration of the SO brand, which at 44ft is right in the strike zone of many buyers, Jeanneau has reimagined what a contemporary cruising boat can be and established a new template with which it will remake the entire SO line. The boat has already been quite successful. Sales are booming, and the new SO 440 was certainly the most visited production boat in its size range at the 2017 U.S. Sailboat Show in Annapolis. 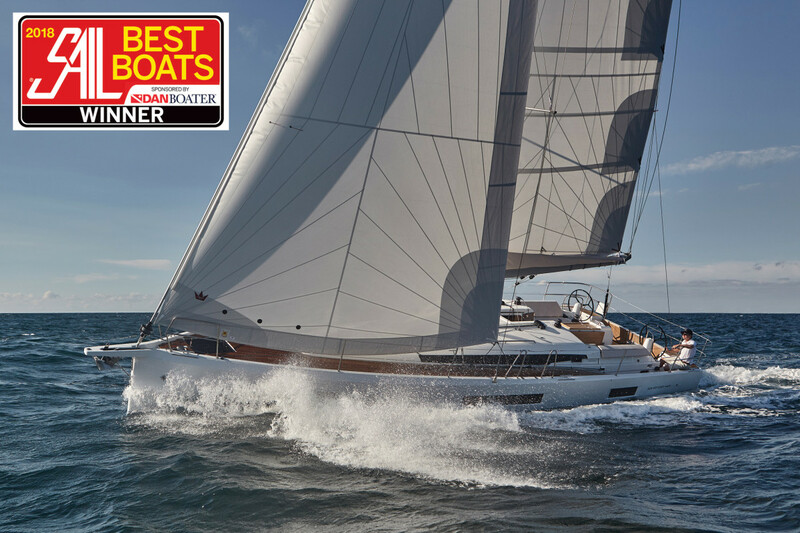 It also a scored a nod from SAIL’s Best Boats judges as Best Cruising Monohull from 40 to 50ft. There’s nothing particularly revolutionary going on here in terms of construction. The hull is comprised of a solid hand-laid fiberglass laminate set in polyester, skinned with a barrier coat and ISO gelcoat. Areas around the chainplates have been reinforced with extra laminate. The deck is injection-molded, cored with discontinuous balsa blocks, and also coated with ISO gelcoat. The twin rudders are set in self-aligning bearings. The cast-iron keel is bolted to the hull. What is new is the hull form, which boasts full-length chines and a fuller, more bluff bow, which according to designer Philippe Briand, is inspired by the latest generation of scow-bowed Mini 6.50s. With the long chine and more beam carried forward, the boat has more form stability and more reserve buoyancy in the bow. There is also, of course, more room for interior accommodations. With this latest model, Jeanneau has gone to great lengths to improve deck and cockpit ergonomics. The most striking new feature is the side deck arrangement, in which they slope downward as they move aft, eventually merging with the cockpit sole to create a pair of great walk-through spaces around each of the twin helm stations. This, in turn, makes it possible for crew to move fluidly from the cockpit to the deck without ever having to climb over anything, and for the helmsman to stand comfortably outboard of either wheel while steering. There are also outboard helm seats, and the helm instruments are canted outboard toward them to maximize comfort when steering while seated. The two Harken 46.3 self-tailing primary winches are set inboard of the wheels, where they can be quickly accessed by either the helmsman or crew. The cockpit coamings, meanwhile, are quite high, providing great back support, and can also be folded flat to form sumptuous sunbathing platforms. The starboard cockpit settee is L-shaped and hooks around the cockpit table to increase the boat’s al fresco dining capacity. The companionway is offset slightly to port, so that foot traffic between the cockpit and interior is naturally routed to that side of the table. Inside the table is a clever removable electric cooler that plugs into a 12-volt socket. Under the starboard helm seat there is also a small utility sink and a portable deck barbecue that can be set up onboard or taken ashore (along with the cooler) on picnic expeditions. Moving forward you’ll find crew mobility is further enhanced by the split outboard cap shroud and inboard lower shroud, which allows you to walk to the bow without swinging around any standing rigging. A nice raised gunwale all around the deck also creates an enhanced sense of security. Finally, up on the coachroof you’ll find the boom’s gooseneck fitting is set unusually low on the mast so as to enhance access to a standard slab-reefed mainsail. The layout below is very open and light, with lots of deck hatches and portlights to provide a view of the outside world, and a large pair of fold-back double doors that lead into a voluminous forward stateroom. With the doors left open, the forward stateroom and saloon become, in effect, one grand loft space, creating the impression you are on a much larger boat. The galley is set slightly forward to port. A shallow U-shaped countertop that incorporates an Eno stove and oven and a front-loading Vitrofrigo fridge allows you to brace in place when the boat is underway. Just opposite to starboard is a U-shaped settee wrapped around a dinette table, with extra seating on an inboard ottoman that kicks out from under the table. Two large storage modules are located either side of the saloon’s central walkway just forward of the companionway. Behind these is a generous nav station to port and a head with a segregated shower stall to starboard. Depending on how you fiddle the locks on the doors, the head can be used either as a day head, accessible to all the crew from the saloon, or as a more private ensuite head, accessible only from the starboard aft guest cabin. Our test boat had a two-cabin layout, with an enlarged starboard aft cabin and a great systems/storage space to port. The latter could easily swallow an extra mattress to sleep less fussy guests. There is also, however, a more conventional three-cabin layout with two equally sized aft cabins to house guests more equitably. The aft berth on our test boat was extremely large, but there was little vertical clearance over it. The forward cabin, as mentioned, is huge, with a large island double berth and an ensuite head (also with a separate shower) all its own. 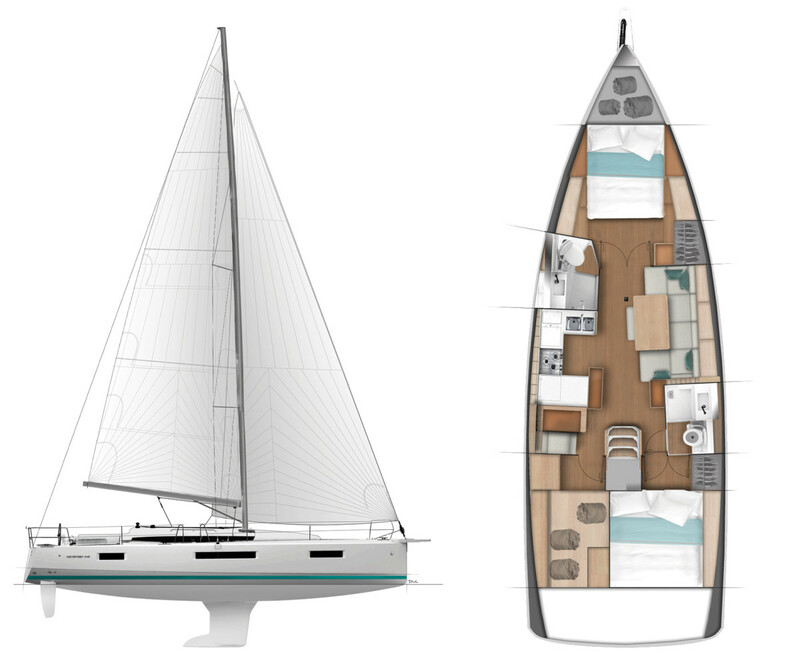 A third layout suitable for charter boats, wherein the forward cabin is bifurcated into two much smaller cabins, is also available. The Sun Odyssey 440 in its standard configuration comes with an anodized aluminum fractional-rig mast from Sparcraft and polyester Elvstrom sails, including a partially battened slab-reefed mainsail and a 125 percent genoa. Lines from the mast are led aft above the deck to twin sets of Spinlock clutches that feed a pair of Harken 40.2ST winches on the coachroof. Our test boat was equipped with an Elvstrøm in-mast furling mainsail. Unfortunately, we did not get to make much productive use of our sails during our test, as conditions were killingly light, with just 2-4 knots of true wind whispering over a glassy flat Chesapeake Bay off Annapolis. With our full main and genoa set, it was all we could do to keep the boat creeping along at 1 to 2.5 knots sailing at a 50- to 60-degree apparent wind angle. That said, the sails did set nicely, the helm was pleasantly neutral, and the boat was not inclined to bear away from the nearly nonexistent breeze. While sailing, the cockpit ergonomics did, indeed, prove amenable. Moving around this boat as you work it is a joy. The standard powerplant is a 45hp Yanmar common-rail diesel engine with a conventional shaft drive turning a fixed three-blade propeller. A 57hp engine is available as an option but hardly seems necessary. Our test boat motored along quite nicely, making 6.5 knots of speed with the standard engine turning at just 2,000 rpm. At 2,200 rpm our speed increased to 7.1 knots. With the throttle all the way open at 3,100 rpm, we made 8.5 knots. Backing down in reverse, I found the boat was easy to control once it got moving. You want to be a bit aggressive with the throttle at first so as to get water flowing over the twin rudders. Our boat was also equipped with an optional Quick bow thruster. Because of the extra volume in the bow, this is installed farther forward than you’d expect, and as a result, I found it quite effective. In creating this boat Jeanneau has set a new standard in mass-production mid-size cruising boats. 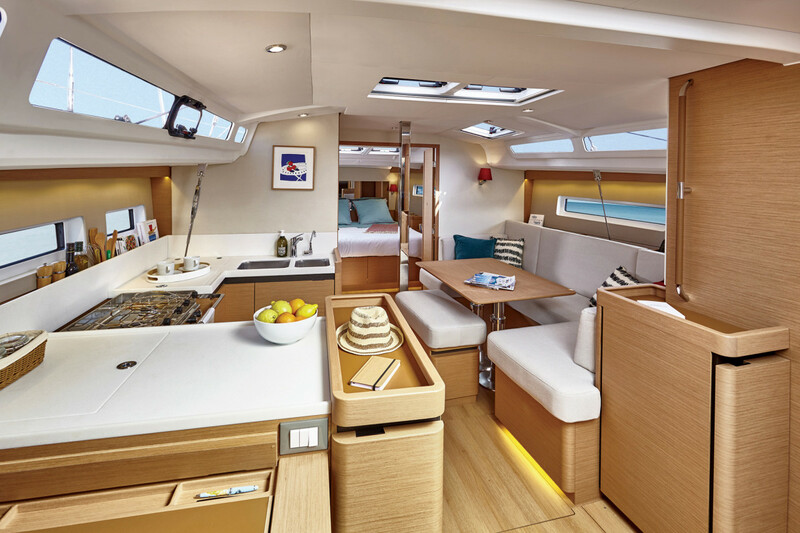 This new Sun Odyssey 440 is unusually comfortable to sail and live aboard, both above and belowdecks, and is full of clever why-didn’t-they-think-of-that-before ideas. It is a boat that demands attention from both cruising families and cruising couples.